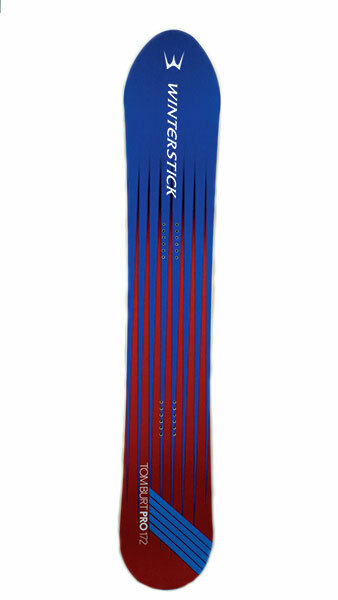 For many of us old-timers, Winterstick defined powder boards. Their classic swallowtail and tapered roundtail models begged for powder. Now with Tom Burt at the helm, the company remains true to its unique roots while producing a modern snowboard made of going big on the steep and deep. This big board is not designed to be ridden gently. With a massive 11 meter radius side cut, it bombs big arcs down the hill. Want to make tighter turns? You’ve gotta bend the board to your will. Combine the directional shape and flex, 4 mm of taper, and 3 cm stance set-back, and you might have the ultimate big-mountain ride for the ultimate big mountain rider. Enough taper to float in powder, but not so much that you give up edge control in a hard fast carve. Dominate this board or it will dominate you. Our thoughts: This board is a beast. If you are looking to charge hard and aren’t afraid of speed, this board is up to the challenge. But if you want even a slightly mellow ride, look elsewhere. This board is not designed for slowness. Shape: Directional. Massive 11m sidecut. 4 mm taper. Stiff progessive flex.